Let your taste buds transport you to an exotic destination as you experience the wonderfully exciting flavors of the tropics. Dried papaya with its hint of cantaloupe flavor mingled with delightfully sweet coconut, hints of citrus from the kiwi slices and mango bits and delectable nutty flavors come together to create a unique combination of palate-pleasing flavors. Cashews Roasted Unsalted, Diced Papaya, Diced Pineapple, Coconut Slices, Macadamia Nuts, Diced Mango, Cashew Pieces Roasted Unsalted, Kiwi Pieces. I love the blend of this trail-mix. Very colorful. Great for kids. More on the sweeter side. Such a delicious trail mix! This is certainly unique, with such exotic dried fruits. I’m a fan of all these ingredients. The dried fruit couldn’t be better. I love the combination of the kiwi, papaya, mango and pineapple! The coconut slices are also delicious, with just enough sugar on them. The macadamia nuts and cashews are perfect with these fruits, my only complaint is that there aren’t enough nuts in the blend to balance out the fruity flavors. The right balance of nuts to fruit would make this blend perfect. I love that the pieces are so small that a small mouthful will probably include all the ingredients to really let the flavors coexist. One of the pricier trail mixes (but I think all the prices on Nutstop are great anyway) but for a unique treat, this trail mix is certainly worth it. great mix! the coconut shavings are amazing! Always a favorite mix type and this blend is the best I’ve had! Very good blend of dried fruits. THIS IS ONE OF THE BETTER ONES I HAVE TRIED, IT HAS ALL KINDS OF DIFFERENT FRUITS TO TRY, MY GRANDDAUGHTER LOVES IT. I PROBABLY SHOULD HAVE BOUGHT MORE, I STORE IT IN A SEALED CONTAINER AND IT IS ALWAYS FRESH. Another outstanding product. Fresh, and great tasting. These were good the cashews seemed a little to soft but I think that could be due to them being with the fruit. Truly a nice snack, every one likes it. My expectations for this blend were not high. Wow was I surprised. Almost hard to believe it is all natural fruit sugar that sweetens the mix. The trail mix that I received was very fresh! There is a nice balance between nut and fruit flavors. 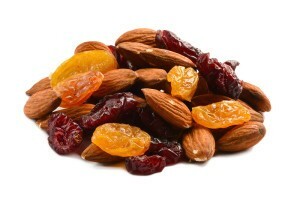 This is a really nice, happy-flavored trail mix!